Good morning, and welcome to the Three's A Charm Blog Hop. Now why, you might ask, are we calling this a Three's A Charm Hop? Well, it's because three digital stamp companies have come together to bring you some fabulous and inspirational artwork. 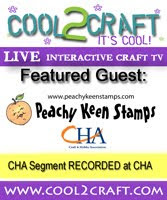 The participating companies are: Sew Many Cards, The Stamping Boutique, and Sunshine's Stamps. So now, on with the hop!! If you arrived here from my dear and talented friend Jeanette's Blog, then you are on the right track. If you just happened along, then you'll surely want to go back and start from the beginning at the Sew Many Challenges Blog so you won't miss any of the fun and fabulous creations. The card I'm sharing with you today was made with the adorable Audrey enjoying yet another of her many interests, and this time it's horse back riding. Horse Back Riding Audrey is one of the newest digital stamps available from The Stamping Boutique, and was so much fun to work with. I colored her with my Copic markers using the stippling technique. I had some of this wonderful rope stashed away, and it was just calling to me to be used for this card. The patterned paper is from Creative Imaginatioins, and worked so well with this project. Your next stop on this hop is at the wonderfully talented Kim's Blog. I know she's got something inspiring to share with you, so what are you waiting for? Get hoppin'!! Should you happen to get lost along the way, head back to the beginning at the Sew Many Challenges Blog, where you'll find a complete hop list in correct order. Be sure to leave some comment love to your participants along the way, because there's going to be prizes awarded to one lucky commenter, and it could be YOU!!! Thanks for hopping along with us today! Have a beautiful day, and a fabulous weekend! That is awesome, the coloring is Fab. Thank you for sharing your work. Gorgeous card..Love the coloring and the robe is fabulous. LOVE LOVE LOVE your card!! What a cute image!!! I grew up with horses and still love them .... I'm going to have to pick this image up!! Love the rope ... awesome touch! I am glad you added the rope, seems that I can never part with great things in my stash! This just darling. The coloring is fabulous. Love the embellishments. I'll have to investigate the stippling coloring technique. I love the coloring you did on Audrey and her horse. Thanks for being a part of SMC's blog hop. What a beautiful card, I see why the rope was calling you. What great colors. Beautiful card - and fantastic coloring! oh, what fun Lorie!!! Fabulous card, beautiful coloring!!! Love it! The rope frame is absolutely perfect for this! What a great card. I love this Audrey image. I like how you've done the border. Hi Lorie! This card is cute! Your coloring is perfect on little Audrey and her horse! Love the western looking papers and the added rope! OH MY GOODNESS--how did you get your horse so gorgeously real looking? I LOVE it!!!! Your coloring is gorgeous and I love the rope embellishment. this is too cute! I love the rope and the image is colored so beautifully! Awesome card! The rope is the perfect addition! Fabulous card, love the way you used the rope, fantastic!!! How cute! Your coloring always amazes me and so much wonderful detail through the embellishments. I love it! Great card. I love what you did with the rope. Oh wow! I love what you did with that rope and the hardware! How did you get the rope to stay coiled exactly where you wanted it to? Glue dots? Awesome, Lorie!